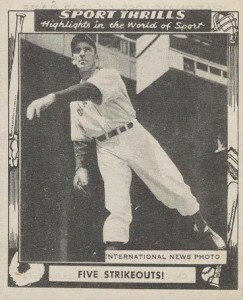 Carl Hubbell's remarkable career became a thing of legend after pitching just a few innings in the 1934 All-Star game. Outside of that single performance, Hubbell was arguably the best pitcher of the 1930s and a hero of New Yorkers as the Giants captured the World Series title. 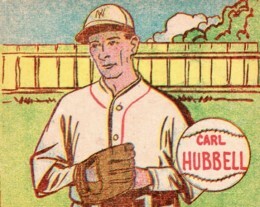 Nearly matching the greatness of his career, we highlight the top Carl Hubbell baseball cards to collect. Shop for Professionally Graded Carl Hubbell Cards on eBay. Given the nickname "King Carl," he was certainly king of the screwball pitch which has been almost universally abandoned by pitchers today. As he was left-handed, the screwball pitch acted like a reverse curveball and moved toward left-handed batters and away from right-handers. He used the pitch to dominate the National League and had five consecutive 20-win seasons. During that same period, he was twice named National League MVP and was the leader in wins and ERA three times. Alongside his first MVP season in 1933, Hubbell helped propel the Giants to the World Series title over the Washington Senators. His second MVP season was notable as it happened during one of the most impressive pitching streaks ever. 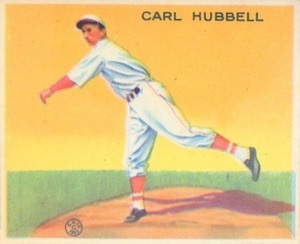 Between the end of the 1936 season and the start of the 1937 campaign, Hubbell won 24 consecutive games, which is still a record today. As impressive as Hubbell's statistics were, his reputation as an elite pitcher was firmly set during the 1934 All-Star Game when he struck out five of baseball's greatest hitters (more on that on card #9 on the list). 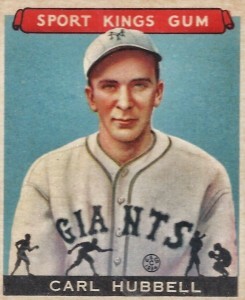 After his retirement, the Giants would make him the first National League player to have his number retired and Hubbell would remain on the Giants payroll for the rest of his life. He would also lead an impressive 1947 Hall of Fame class that included Lefty Grove and Mickey Cochrane. A few other notable Hubbell appearances from his playing days include a card in the final Goudey release. Hubbell's card is bright yellow and is one of the most valuable non-short prints in the set. You can also find Hubbell cards in two of the more popular sets from the 1930s and 40s: Batter-Up and Double Play. On his Double Play card, Hubbell is paired with teammate Morris Arnovich who roamed the outfield for the Giants. As you can see, constructing a list of the best Carl Hubbell cards is difficult given the many viable options. In building this list, card value was balanced with overall availability to produce a comprehensive cardboard snapshot. The art of the 1943 R302-1 set issued by Michael Pressner and Company is sometimes criticized as being of poor quality when compared to the Goudey or the Diamond Stars sets. Despite this reputation, Hubbell's card works well and displays a comic-book look. Six years later in 1949, some of this set was reprinted and new cards were added. However, Hubbell's card was not included in the updated batch. 1948 Swell Sports Thrills features 20 cards that honor some of baseball's most memorable games and achievements. 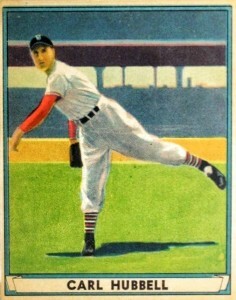 Hubbell's card highlights his amazing performance in the 1934 All-Star game when he dismantled the American League's lineup one batter at a time. Hubbell consecutively struck out Babe Ruth, Lou Gehrig, Jimmie Foxx, Al Simmons, and Joe Cronin to solidify his legacy as one of the best pitchers ever to take the mound. 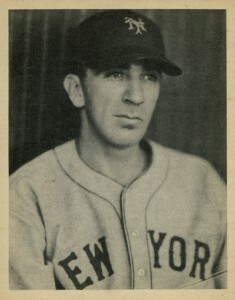 Fans of simplicity in their baseball cards should turn their attention to 1939 Play Ball which features just a black-and-white photo on the front side of the cards. The reverse side has a detailed biography of each player and, over time, collectors have found various typographical and wording variations for nearly every option in the 161-card set. Collectors looking for a Carl Hubbell autograph will have to rely on signed baseballs or cut signatures as King Carl passed away in 1988 before certified autographs gained in popularity. Upper Deck has included Hubbell in several of the Legendary Cuts series of sets, including the card below from 2003. Hubbell's signature is positioned more vertically than horizontally and has the distinctive slash through the middle of the autograph that serves as the line connecting the middle of the "H."
Although the 1934 Goudey set was famous for having superstar players provide commentary about each player featured in the set (more on that at card #4 on the list), the colorful Diamond Stars set did something similar by having their write-ups attributed to the editor of the Boston American newspaper, Austen Lake. His signature was added at the bottom of each biography on the card's back. The Four-On-One sets of picture cards were issued by Exhibits each year from 1933 to 1938. Many photos were reused but the players featured on each card would often change from set to set. These releases give collectors a chance to own a card featuring Hubbell and longtime Giants slugger Mel Ott, who was teammates with Hubbell for his entire career. Hubbell's 1934 Goudey card features a write up on the reverse side attributed to Yankee's slugger Lou Gehrig. 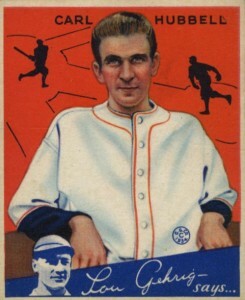 Although the cards featuring "Lou Gehrig says..." at the bottom of the card are by far the most famous, there are also cards featuring Philadelphia Phillies outfielder Chuck Klein on a red banner providing thoughts on the players as well. 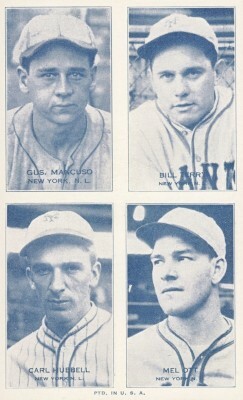 After releasing two sets of black-and-white trading cards, Play Ball went with painted versions of photographs for their 1941 set. 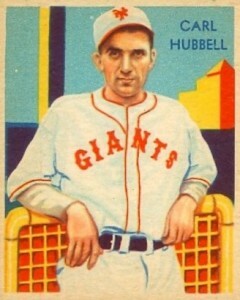 Hubbell's card is a colorized version of the identical image in 1940 Play Ball and subjects higher on the checklist may have actually been released in 1942 as the 1941 copyright line was removed from those cards. 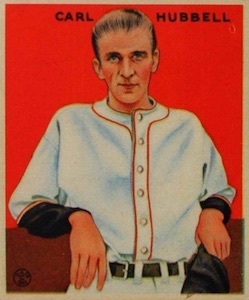 Carl Hubbell has two options in the 1933 Goudey set just four cards apart on the checklist. Along with this beautiful card showcasing Hubbell in his pitching pose, his other card shares the same painted photo as his 1934 Goudey card. The reverse side of the card reminds us that before his record was bested by Don Drysdale and Orel Hershiser, Hubbell held the record for most consecutive scoreless innings at 45 1/3. Perhaps no other one-off set has enjoyed the longevity and popularity as 1933 by Sports Kings Gum. The brief 48-card set includes many non-baseball sports figures but the cards featuring baseball stars hold the most value. 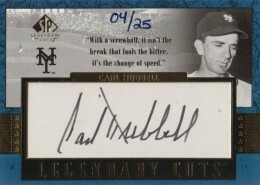 Hubbell's card can reach more than $400 at auction for highly-graded copies. 1934 - 36 BATTER - UP # 5 CARL HUBBELL N.Y. GIANTS !! RARE 1980 Hall Of Fame Carl Hubbell RED Exhibit Card, New York Giants, NICE! 1933 Goudey #230 Carl Hubbell HOF Giants SGC 1 !! 1950 CALLAHAN CARL HUBBELL PSA 9 MINT! ULTRA RARE! NONE HIGHER! SMR $750 RARE!